Wild mushrooms appear in spring and autumn, thrive in forests and love rain. They have lovely names – chanterelles, penny bun, horn-of-plenty, fairy ring to name just a few. 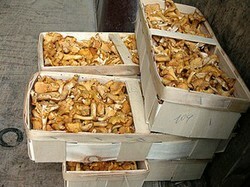 Gathering wild mushrooms is a hobby only for persons who can tell the difference between edible and poisonous ones. Some wild mushrooms can make you sick and even kill you, so bring your mushroom handbook to identify edible ones. Be sure that the mushrooms you gather are fresh and bug-free. You can eat wild mushrooms in many different ways, but never raw. Use them in soups, risottos and sauces. I like them best sautéed in a little butter and accompanied by scrambled egg. Use a mushroom knife and cut them off close to the ground, but never uproot them. Lots of earth will cling to the base. Wipe it off with the brush end of your mushroom knife. Take only big ones and leave the smaller ones behind because they do not have much taste. They leave their spores and produce next year's crop. Mushrooms need lots of fresh air around them. Never use plastic bags or containers to store them because the moisture and the weight will crush and bruise the mushrooms. Gather your harvest into a wicker basket which allows a good circulation of air. Bring your mushroom handbook because it is much easier to determine whether they are edible when they are still in the ground. Only gather the ones you have unmistakenly identified. Apricot-coloured chanterelles are easy to spot. They resemble small trumpets. Penny buns, Steinpilz in German, porcino in Italian, cep in French or Boletus edulis – the scientific name - can become quite large, 7 – 30 cm (3 – 12 inch). Mushrooms are low in fat and high in protein, vitamins, minerals and fibre. In other words they are excellent health food. 2. Melt the butter over moderately high heat until foam subsides. I love to eat this with scrambled eggs and toast. Oh yum, wild mushrooms are so good! We used to find morels in our neck of the woods. But now, I would never go to collect mushrooms alone or without my father at least. It is so easy to make mistake there. Lots of them look similar to each other, and it is easy to collect poisonous one. Good tips you'be got here! Oh yes, I remember doing this when I was a kid with my aunt who's sense passed from cancer. Thank you so much for bringing this knowledge to me as I've tried to remember the tips and tricks she told me over and over, silly kid, didn't listen. I can't wait to do this again. She was great at spotting them. I can identify them just forget when and where is the best time and places to find them. I'm so excited. Only ever collect mushrooms that are easily identified and unmistakeable! Those that are easy to identify, have no other (poisonous) lookalikes, and have good flavor are chanterelles (although there is a harmless false chanterelle), blewits (they are often mauvish in color, and shaggy ink-caps (but don't eat these with an alcoholic drink). Most others can have lookalikes that are dangerous, if not deadly. If you collect, do not rely on a handbook, it is the cause of many bad experiences. Either learn from an expert or take your mushrooms to be identified by an expert. You have been warned. @Jimmie - Always use a good mushroom guidebook, because it is sometimes quite difficult to see the differences between edible and poisonous ones. I've always wanted to pick them. If I ever get a chance, I will. I've always wished I knew enough about mushrooms to go out and collect the good ones. For now I must stick to store bought. The soup recipe sound delicious.